If you've ever worn an angora sweater, the garment's fibers come not from an angora goat but from a rabbit. 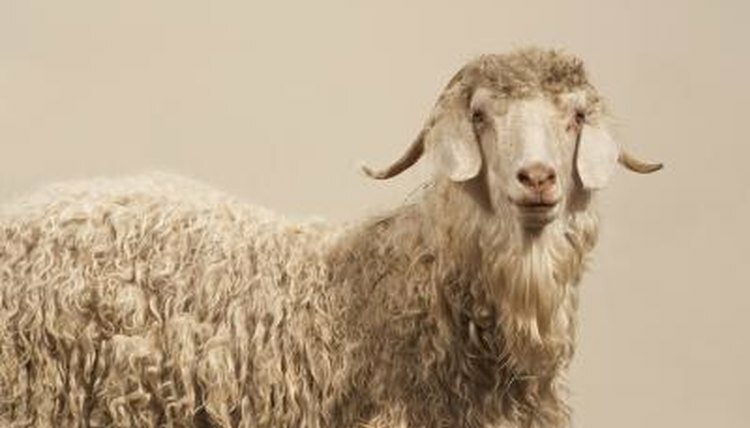 Despite the angora name, goats produce mohair. These relatively small, hardy caprines serve as pets and fiber animals. Grooming is a simple matter of semiannually shearing of their hair. A fabric mentioned in the Bible, mohair bears some resemblance to wool but is smoother, thinner and naturally wrinkle-resistant. Among its advantages is the ability to easily accept dye, along with its strength and luster. Different classifications of Angoras grow different types of mohair. The most desirable type, "C" Angoras grow hair in ringlets, while "B" Angora goats' hair grows flatter. Good nutrition is essential for raising Angoras for mohair. Goats in general are browsers rather than grazers; Angoras boast especially good browsing and foraging talents. Besides companionship and fiber, you can use your Angoras for clearing up brushy, weedy areas. As long as your goats have sufficient browse, they should be fine. Texas A&M University advises that when pastures are short, look to see the condition of the goats' favorite plants. If insufficient browsing area exists, move the goats to another pasture or start feeding cottonseed and quality hay for protein. Make sure your Angoras always have access to clean, fresh water. Keep your goats on a regular worming program, not only for their own health but also to prevent fleece damage from parasites such as lice. Before shearing your goats, clean out the pens thoroughly. The sheared fleece easily picks up contaminants such as hay or manure, so you want the shearing area as clean as possible. Make sure your goats are dry. If there's a possibility of rain, put them inside 24 hours before shearing. Prepare a plywood platform for the actual shearing, upon which you can place a goat stanchion or fitting stand. Begin shearing the youngest goats first, finishing with the oldest males. You'll shear your Angoras twice annually, in the spring before females give birth and prior to the fall breeding season. At these times, the fleece reaches a length of 4 to 6 inches. Large operations have professional shearers, but if you keep only a few goats you can do it yourself. Most livestock shears are designed for sheep, but if you purchase sheep shears you can install a 20-tooth comb suitable for Angoras. You can also use electric horse clippers. If you have a single goat, try shearing with scissors. Put the goat in the stanchion and start shearing or cutting one side at a time, starting at the back and working forward. Shear close to the goat's body, taking your time. With practice, you can shear an adult Angora in about 90 minutes. A goat produces between 5 and 10 pounds of usable fiber at each shearing. Place the sheared fleece in burlap bags. Don't use plastic bags -- these are not acceptable to mohair buyers, according to the University of California Cooperative Extension website. Place tags on the bags with your name, as well as the type of fleece inside. Include the Angora goat classification and the goat's age. A kid's fiber is the most valuable to buyers, as the coat becomes more coarse as the animal ages. If any issues exist, such as burrs or other contaminants within the fleece, list them. Until your goats start growing their coats back, they need protection from the cold. This shouldn't be an issue after the spring shearing, but it can be after the fall event. They require shelter until the hair grows to adequate length, generally 6 weeks post-shearing. Give your goats additional feed after shearing to help keep them warm. If you want to show Angora goats, they're basically presented before the judges "au naturel." They should not be trimmed, washed or clipped. Prettying up your Angora via any of these methods can result in disqualification. How Often Are Sheep Sheared?